A premium quality range of Foot Mats that is known for its features of easy cleaning and high strength.. These Foot Mats are designed using automotive grade vinyl that provides anti skid & cushion feeling.. These foot mats are subject to customization to fit into the decor of the car..
Autofurnish AF4186 Black Car Foot Mat Set For Honda Civic is a premium quality Car Floor Mats from Autofurnish. Moglix is a well-known ecommerce platform for qualitative range of Car Floor Mats. All Autofurnish AF4186 Black Car Foot Mat Set For Honda Civic are manufactured by using quality assured material and advanced techniques, which make them up to the standard in this highly challenging field. 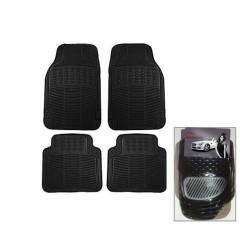 The materials utilized to manufacture Autofurnish AF4186 Black Car Foot Mat Set For Honda Civic, are sourced from the most reliable and official Car Floor Mats vendors, chosen after performing detailed market surveys. Thus, Autofurnish products are widely acknowledged in the market for their high quality. We are dedicatedly involved in providing an excellent quality array of Autofurnish Car Floor Mats.